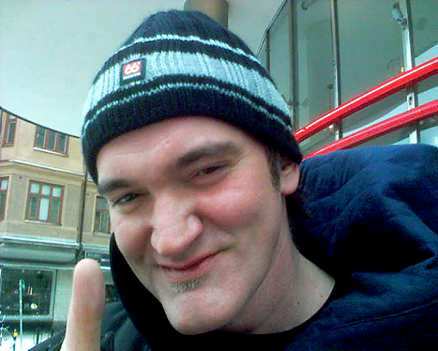 the aftonbladet reports that a female fan spotted quentin tarantino walking in the streets of stockholm, sweden. netta rawner who took the photo above said that he was in stockholm for private matters, not filming. she also said that he frequently visits sweden because he loves the country. young peoples gropings arent as exciting until they get older. now old peoples gropings are more exciting. Only old people groping young people, though. Old on old groping is icky. to continue what i said on the previous page..
he also thought Mickey Rourke deserved an Oscar for his performances in Sin City and Domino. this was said while holding a suitcase filled with Swedish "True Romance" DVDs. July 14, 2006 -- QUENTIN Tarantino was Uma Thurman's knight in shining armor during Wednesday night's big thunderstorm. Thurman was at a party for her funny new movie, "My Super Ex-Girlfriend," on the rooftop at Bed, on West 27th Street, chatting with WB11's Emily Frances when the storm hit. According to a witness, "Things were flying all over the place. Everyone ran for cover, and Quentin scooped her up in his arms and carried her to safety, leaving Emily to fend for herself." Tarantino left the next day for Austin, Texas, to continue filming "Grind House," which he's co-directing with Robert Rodriguez. Wait wait wait wait wait... they expect me to believe that Quentin Tarantino... Quentin Tarantino... can lift and carry Uma Thurman. NOT BUYING IT. On Nov 9th at 9pm, Quentin Tarantino will talk to(?) Fiona Apple (or something) on the Sundance Channel Show ICONOCLASTS. He's also showing Austin "KILL BILL: THE UNSEEN, UNCENSORED FULL-LENGTH CUT"
He's presenting it... I'm a little disapointed because I had a chance to get tickets before it sold out, but reading the description and the run-time, I wasn't sure if this was the same thing as the final cut that he's been talking about or just both movies back to back with the House of Blue Leaves scene in color so I hesitated. Now it's too late. Isn't that all there is to the full cut, though? Possibly with the omission of the line that ended Vol. 1 (and shouldn't have been put there at all)? The only deleted scene I've ever heard about was the one on the Vol. 2 DVD with Spawn. I thought he was going to edit it all together to make it more like one film instead of two films back to back.